After David Chang’s “Fig Gate” incident, it’s hard to order a plate of figs with a straight face. But, I did – in San Francisco, naturally. It was nearing noon the morning after an epic dinner at Manresa (post to come) when I arrived at this celebrated San Francisco restaurant on Market Street. The one thing Rodgers kept from the original menu was the restaurant’s Caesar Salad. I had it. It’s not cheap – $10 – but it is very good. You get a whole head of romaine – so fresh, so crisp – tossed with a zippy Caesar dressing and blanketed with finely grated Parmesan. The croutons might have been the best thing about this salad. A shade of perfect golden brown, they were large and incredibly sturdy, maintaining their structured crunch despite the dressing. There’s a lot of wood-fire cooking here. From the brick oven come pizzas and the restaurant’s famous roast chicken for two with a side of bread salad (allow an hour). From the mesquite grill come fish, meat, and a grass-fed beef hamburger. I ordered the burger. It’s not cheap either -$15 for the base model – but it is also very good. I got it fully loaded: Bayley Hazen blue (add $2), grilled onions (add $1.25), and heirloom tomatoes ($2.25). Stacked impossibly high, it’s a monster. The desserts all looked great (so did the cheese selection). I had a hard time choosing. I ordered the “Piccola Meringata” ($9.75) and a single scoop of Gravenstein Apple-Calvados Ice Cream (normally $7.75 for a two-scoop portion). The piccola meringata was essentially a delicate and dainty pavlova, with alternating layers of impossibly thin meringue wafers, slices of super-ripe Silver Logan peaches, and airy whipped cream spiked with Lillet. Ringed with a wonderful raspberry sauce, this dessert was immensely fragrant and satisfyingly boozy. It was awesome. The ice cream was magnificent. There was a noticeable alcoholic edge to it, rounded out by the wonderfully floral sweetness of the Gravenstein apple. Needless to say, it was extremely rich and creamy. 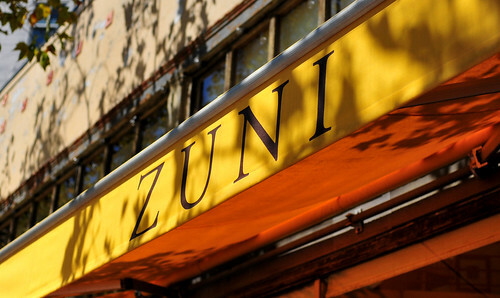 The service at Zuni Café was on the surprisingly good side of café-level service; not over-ambitious, not too casual. While my server was a model employee, the back waiters seemed a bit slapdash, confusing efficiency with over-eagerness when clearing plates. A lot of people roll their eyes when this restaurant is mentioned or suggested as a dining option. 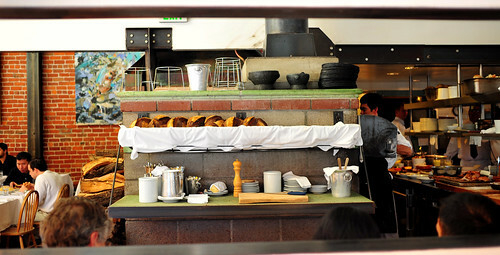 Yes, in 2010, Zuni Café might be considered yesterdecade’s news. But, the ingredients used there are unimpeachable and the cooking technique you’ll find there is sound. It’s really hard for me to object to any of it. You may not learn anything new from the food here. But you will be reminded how just how satisfying simplicity can be. Don’t go to Zuni Café for thrills or excitement. Go for a very good meal and you won’t be disappointed. To see all of the photos from this lunch at Zuni Café, CLICK HERE. * I don’t know what happened to the Bronx grapes. On the menu, it was listed as “Bronx and Zante grapes with Black Mission Figs.” I was especially looking forward to having them, they are extremely scarce. I’ve read that only one farmer in the world – Lagier Ranches – has clippings from the mother vine stocks, of which there only remain two. I will have to look for the Lagier Ranch stand the next time I’m at the Ferry Marketplace Saturday morning Farmers’ Market. ** Here’s a piece of my mind on oddly shaped burgers: CLICK. ~ by ulterior epicure on October 2, 2010. I love Zuni & I love it you went there ;-) it’s a place that I can guarantee to have a good meal with friends, regardless, & not worry about dressing up & being formal ;-) then down the ally a small wine bar *1 of me secret place*! It is a good casual place. I had a dozen fresh oysters with some Quincy French wine to start and the roasted chicken for two which was really good.